The short, thick rootstock produces a round, hollow stem 3 to 6 feet high and branched near the top. The leaves vary from long-petioled and decompound, with incised, ovate leaflets, to sessite and simple near the top. The small, pale yellow flowers grow in compound umbels from June to August. The whole plant has a strong, aromatic odor. Found wild in southern Europe and Asia Minor but widely cultivated all over the continent. Essential oil with phthalidene, terpineol, carvacrol, isoveleric acid, coumarin, angelic acid, malic and benzoic acid, resin, starch, and sugar. The roots of lovage add an aged-like essence to cordials, gin and bitters when properly used. The old timers say that lovage is rubbed over the bait, any kind of fish bait, that as long as there are fish within yards of the hook, you will be pulling them in. Used to treat fluid retention, bloating, gastric catarrh, stimulates appetite, and flatulence; also may be used to promote perspiration and counteract colds and flu. Lovage is most used for its diuretic properties in cases of water retention and urinary difficulties. Skin problems will sometimes respond to a decoction added to bath water. Dropped into the eyes, it will take away the redness or dimness of them; also takes away freckles or age spots, and boils. Rootstock can be used fresh or dried. Infusion: 1 tsp. fresh or dried root to 1 cup water. Take 1 or 1 1/2 cups per day. Decoction: boil 1 1/2 to 2 oz. rootstock in 4 to 6 qt. water for use as bath additive. 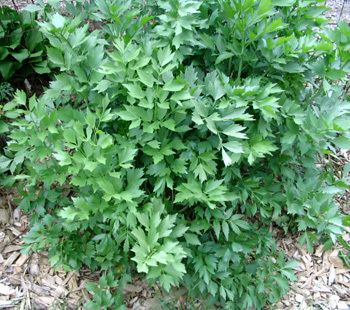 In excessive doses, lovage can cause kidney damage; this herb should not be used by those with kidney problems. Lovage promotes the onset of menstruation and should not be used by pregnant women.